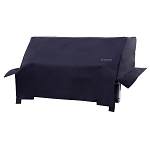 Protect your Sunstone Drop in Ice Chest with this weather and water proof cover. Built for the Drop in Ice Chest. Waterproof protective cover for drop in ice chest; designed with heavy duty nylon lined vinyl material and is a great to protect the ice chest from dust, it has elastic on the bottom to keep it secure. Fits Sunstone and DCS grills.